Switzerland's Travel and Lifestyle Magazine in English and German. Best travel tips in Switzerland and the world. Yearly subscription is only Sfr. 15. A magazine for the greater Basel area, The Basel Journal has indepth reporting on local personalities, culture, art, business, news items and editorials. What makes this magazine unique is that in the magazine, all articles are written in both English and German, presented side by side. The is the first of its kind. Beautiful photography and interesting behind the scenes reading, the magazine is hoping you will be part of the discussion on their web site. Grüezi Newcomer! 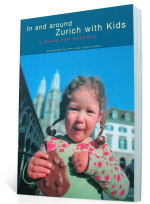 Insider's guide around Lake Zürich will be updated every 2 years and is based on facts and personal recommendations. It covers a broad range of subjects related to every day life and living such as managing administrative issues like finding a home and registering a car, searching for a job, organizing childcare, commuting, going out, and much more. Our aim is to facilitate newcomers' relocation to the area and their integration. Where to find it? In Switzerland, available at these stores or direct at http://www.gruezinewcomer.ch/. Their site is undercontruction - you can follow them on Facebook to learn more. Now an online magazine. And it's not just for mothers anymore. Take a look! Swiss News is Switzerland's only national English-language monthly news magazine, focusing exclusively on Swiss news and events from the expat perspective. We cover politics, business, news, sports, culture, places to go and people to know. You can find us at major kiosks and English bookstores (Orell Fussli in Zurich and Off The Shelf in Geneva) or by subscribing online. AngloPhone Information Services provides extensive information on Switzerland via the phone (phone:0900 576 444), Swiss Style magazine and the web to Business Travellers, Residents and Tourists. Tales from a Small Planet, a non-profit web magazine and online resource,features Real Post Reports: honest reports on living conditions abroad from diplomats and other expatriates all over the world. It also offers lively and evocative writing about the expat experience, information on all aspects of international living, and interactive support through our email groups and message boards. For the real story on what it's like to live overseas, visit www.talesmag.com .